Believe me!…If you ever been on a Tarpon Fishing Charter with Capt. Kevin Walton then you’ll want to go again SOON and you’ll be Hooked for a lifetime! Tarpon have a mouth like armor made up of mostly bone cartilage making hookups on one of these bad boys almost impossible. The saying goes that if you hook 10 you may land 5. Why you say? Well to start with you should know that Fisherman call Tarpon “The Silver King”.They are the largest inshore species and one of the most sought after game fish on Tampa/St. Pete Fishing Charters. Secondly Tarpon are the King of an Inshore fish fight. A true hookup is full of shock and awe. When you hook a Tarpon you better “Bow to the King” or he will bust your line, spit out your hook, or toss your plug into the air and bid you farewell. The term “Bow to the King” is exactly what you will hear from your guide when he tells you to ” lower your rod every time he jumps or you’ll lose him”! Tarpon range in size from 10 to over 200 lbs. The Florida record Tarpon is 243lbs. and was caught back in 1975 in the Keys. When hooked they will take to the air with spectacular leaps ranging 6-8 ft or more and they have been know to jump right into your boat. They can do all this even after ripping off 100-200 yards of line as you drag sings the Fisherman Song and make you chase them down for an hour or more. Let’s just say that you will think you latched on to a runaway train! Between the leaps they will sound deep only to be followed by another acrobatic leap again and again! These leaps and aerial somersaults are the tactics the Tarpon use to try and shake the hook from his mouth and that will even happen when you do get lucky enough to get a good hook set. After a fight of anywhere from 15 minutes and sometimes over an hour…Out of breath, arms like rubber, stomach and back muscles whipped by “ The King” and salivating as your heart rate jumps with excitement and your mind is filled with disbelief you will take a rest in awe and ponder at what the heck you just hooked into. 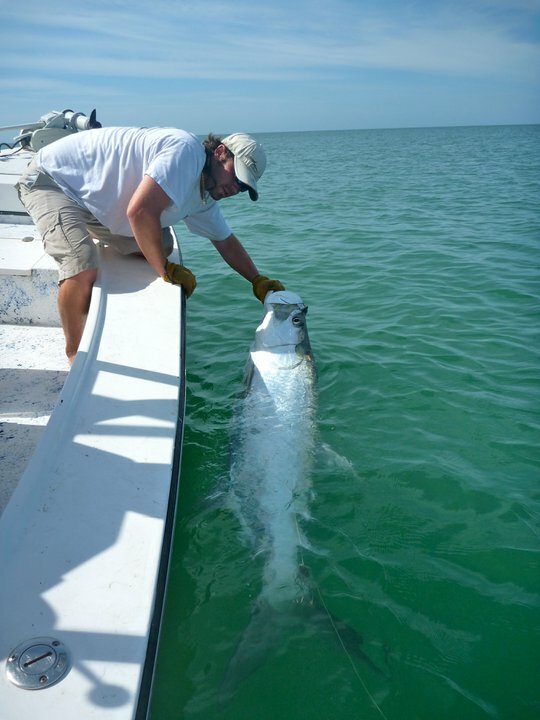 Folk’s if Tarpon fishing doesn’t get you excited then you seriously need to check your pulse. The key months for a Tarpon Fishing Charter are May to the end of October, but the best months are June and July. This is the time of year when huge schools of mature Tarpon migrate up and down the Florida coasts. This is the time to catch that Tarpon of a lifetime. Any where that the bait fish are is where you can bet to find that “ Silver King “ you heard about from other fisherman or you may have read about or you possibly only dreamt about. Whatever the case you owe it to yourself to experience a true Tarpon Fishing Charter with Capt. Kevin Walton as you can see from the photos …He’s knows the thrill of “The Silver King” and he will make it all happen for you. He can make that special day of memories when you “Bowed to the King” and then conquered him to the boat for that Kodak moment that no one can ever take away from you. Next post: We don’t really call it Fishin’…We call it Catchin’, because that’s what we do! If a ‘sure-thing’ Flats Fishing Charter in the Tampa/St.Pete Beach area is what you’re looking for, then you just found it. Call (727) 638-0975 and book your St. Pete Beach Fishing Trip today!